How to deal with excessive mucus in throat? Why is mucus so important? What does mucus appearance mean? How to get rid of excessive mucus in throat? How to deal with too much mucus in throat with medicines? One medical expert emphasized the importance of mucus by saying, “It’s like oil for the body’s engine. Without oil, an engine cannot run. Mucus secreting tissues form the lining of the oral cavity, nasal cavity, sinuses, gastrointestinal tract, nose, and lungs. Mucus acts as a protective covering over these body cavities and organs, preventing the tissues underneath from drying out. It is crucial that these cavities remain moist to function in a normal manner. Mucus not only keeps internal body cavities moist but also protects them from foreign particles like dirt and bacteria and other germs, especially in the case of a sensitive respiratory pathway. It is a sticky and viscous matter and easily traps foreign particles. Mucus also has antibodies that help the body identify aggressors like viruses and bacteria, enzymes that eliminate the microbes and germs it traps, proteins that give mucus its gooey and sticky quality, and a variety of cells, besides other substances. Even in a healthy state, the human body is a mucus making machine, producing approximately 1 to 1.5 liters of the mucus per day. Most of that mucus drips down the throat and we don’t even notice its presence. But there are times when mucus makes its presence known – usually when either we’re producing an excess of it or when its consistency changes. It usually takes an allergy, the bad flu or contact with an irritant or allergen - like a plate of spicy food - to significantly increase production of mucus. For example, when your body is going through an allergic response to a trigger, such as dust or pollen, mast cells in the body secrete out a chemical known as histamine, which sets off itching, nasal stuffiness, sneezing and irritation in the throat. The tissue of mucus membranes go into overdrive and start producing a lot of mucus, causing a runny nose and a phlegmy throat. Some people also produce excessive mucus after drinking milk. Experts say that this happens due gustatory rhinitis. It is a reflex reaction of body triggered by eating. Gustatory rhinitis is the reason why nose becomes runny after eating spicy food. Milk proteins trigger the same type of reaction in some individuals. You might have noticed that mucus isn’t always clear or transparent. It is sometimes green, yellow ormay have a brownish or reddish hue to it. Each color denotes different health conditions. When you are suffering from a cold, the immune system promptly sends neutrophils or white blood cells to the area. A greenish colored enzyme is present in white blood cells, and when released in large numbers they give mucus the same color. A little mucus in the throat once in a while usually does not do any considerable harm or cause any discomfort. However, chronic presence of mucus in the throat can be a cause for trouble. If there is a lot of mucus present in your throat on a constant basis, this is called as mucus build up and it can make you miserable. It can obstruct your respiratory pathways and feel like it is always present in your throat. Catarrh is an accumulation of mucus in a respiratory pathway or body cavity. Mucus usually builds in the throat, posterior part of the nasal cavity or in the hollow bony spaces of the face called as sinuses. Build up of mucus in throat may be short lived, but some people experience it for a long time, even for months on end. This is called as chronic catarrh. Catarrh can be pretty irksome and difficult to get rid of, but it does not usually cause any lasting damage and can be treated. Post nasal drip develops when an excessive buildup of mucus and phlegm in the throat and nasal cavity causes coughing. Mucus appears to accumulate in the throat overnight, which results in congestion in the morning. When you suffer from a cold or flu, in the initial stages thin, clear, runny mucus is secreted in nasal cavity and back of the throat. When the body’s immune system revs up and starts reacting to the virus, the initially thin mucus becomes thick and turns green or yellow. This is an important symptom of viral cold. A lot of people are affected by seasonal changes in the form of allergies every year, usually in late winter to summer. Unlike the flu, the manifestations of seasonal allergies such as coughing, sneezing, itchy eyes and mucus in the throat will appear simultaneously. There are various types of allergens that trigger these symptoms including mucus in throat. Pollen of trees and flowers is one of the main culprits behind seasonal allergies, and the symptoms usually last until the triggers disappear. Some food items can also cause build up of mucus in throat. Milk and dairy products, such as cottage cheese, yogurt, buttermilk, and butter, cause secretion and accumulation of excess mucus in the throat. These dairy items have a protein called casein present in them that increases production of mucus and this protein is hard to digest. Besides dairy products, sugar, caffeine, salt, non herbal teas, (particularly black tea), all stimulate excess secretion of mucus. Soy is one of the main mucus making plant based food items. Those who give up dairy and meats and use soy products are at greater risk of having mucus accumulation in the throat. During pregnancy, a lot of women experience symptoms of coughing, sneezing and nasal congestion. These symptoms are quite commonly observed and are as common as morning sickness and backaches during pregnancy. Estrogen is known to intensify mucus secretion and it causes the mucus to get very thin or thick. Throat diseases such as strep throat, tonsillitis, pharyngitis and laryngitis often feature build up of mucus in the throat as a common symptom. Viral diseases such as measles, chicken pox, whooping cough, mononucleosis or croup may also cause build up of phlegm in throat. Irritants such as cigarette smoke, polluted air, and traffic or chemical fumes, may also trigger excessive secretion of mucus and cause it to settle down onto the lining of the throat. Build up of mucus in throat also causes smelly breath as it contains high protein content and anaerobic bacteria thrive on it. The excessive mucus that accompanies an infection can persist in the throat for a long time. It normally clears up within four to six, but in some people, the problem can drag on for months. This may result in a buildup of bacteria and a bacterial infection may follow a viral infection. Excess secretion and build up of mucus in the throat following a respiratory infection is commonly observed in children. It lasts for about four to six weeks. Even though an upper respiratory infection is a main cause for accumulation of mucus in the throat in children, seasonal allergies can play a role in this regard as well. Children are vulnerable to seasonal allergies ranging from late winter to the end of summer months, just as in adults. Some medications have adverse effects that cause you to cough and clear your throat all the time. ACE inhibitors and angiotensin receptor blockers (sartans) may cause accumulation of mucus in throat. These drugs are used for the treatment of hypertension or high blood pressure. Consult your doctor about changing your medicine and replacing it with drugs such as beta-blockers or calcium channel blockers instead. Most cases of chronic rhinitis are caused due to allergies and the major symptom is mucus in the throat. Chronic rhinitis can affect you at any time of the year upon exposure to irritants or allergens such as house dust and mites. It is not triggered by seasonal allergens such as pollen, though. When acidic or non-acidic material from the stomach travels upwards against gravity (reflux) to the esophagus this condition is called as laryngopharyngeal reflux. When the acid from stomach reaches your throat, the lining of mucus membrane in the throat is irritated which cause mucus in throat. To avoid this problem, don’t eat spicy and fatty foods and stay away from irritants such as alcohol. Keep your head in an elevated position, especially during sleeping. Nasal polyps are non-cancerous or benign, fleshy swellings that appear inside the nasal cavity or sinuses. Besides causing nasal congestion and a runny nose they also cause mucus in the throat by postnasal drip. Nasal sprays or steroid nasal drops are mostly used to shrink nasal polyps. Sometimes, surgical removal of nasal polyps might be required. A lot of times, nasal polyps return even after surgery, so steroid nasal sprays are used to prevent recurrence. Usually, the causative factor is not known. 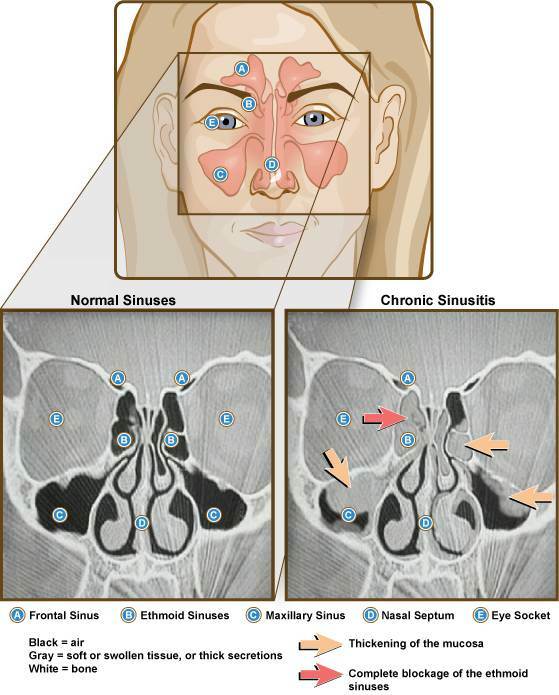 Most probably chronic inflammation in the nasal cavity causes swelling and edema of the inner lining of nostrils. The swelling hangs due to gravity and becomes a polyp. Polyps usually appear in both nostrils and may enlarge over time, obstructing the nose. There are many medical conditions that may cause build up of mucus in the throat. It is important to know their symptoms so that mucus in throat can be treated accordingly. Symptoms of allergic rhinitis may appear within moments or hours after you are exposed to an allergen. The symptoms can possibly last for days. Sneezing over and over again. This happens particularly after you wake up in the morning. Itchy, watery eyes. This could possibly be allergic pinkeye. A congested nose, accompanied with sniffing. Sniffing is a very common symptom in children. Heavy breathing through mouth because the nose is blocked. Mood swings and feeling exhausted and grumpy. The frequency of occurrence of these symptoms is different in different asthma patients. A person may not show all of these symptoms or he may exhibit different symptoms at different times. Asthma symptoms may also vary in the same person. They may be mild during one attack, but severe in another. Some asthma patients may go for long periods without experiencing any symptoms but this temporary lull is interrupted by periodic worsening of symptoms during asthma attacks. Some patients may exhibit asthma symptoms every day. Besides this, some patients only suffer from symptoms during exercise, or during viral infections such as common cold. Mostly people have mild asthma attacks. The respiratory passages clear up within a few minutes to a few hours. Severe attacks take place less frequently but for a longer duration of time and are more persistent. It is vital to identify and treat even mild asthma symptoms to help you prevent more serious asthma attacks and to control the disease in a better way. The most important symptoms of GERD are heartburn, acid taste in the mouth and regurgitation. Heartburn usually is a burning pain that emanates from the center of the chest. It may start high up in the abdominal cavity or may extend up the back or neck. At times, the pain may be sharp or pricking instead of a burning sensation. Such pain is identical to angina pain. Usually, heartburn associated with GERD is seen more commonly after a heavy meal. A sore throat. If the regurgitated acid reflux passes the upper esophageal sphincter, it may enter the pharynx and even the larynx or voice box, causing sore throat, mucus builds up and hoarseness of voice. Persistent dry cough, particularly at night. GERD is a common cause of the inexplicable onset of coughing. It has not yet been determined that how GERD causes coughing. Asthma. Reflux acid may aggravate asthma by irritating the respiratory passages. Asthma and the drugs used to treat it may exacerbate GERD. Many people also have tightness in chest, sensitivity to chemicals, odors, fumes and sinus infections. Rarely, some individuals with nasal polyps are also allergic to aspirin and have a reaction to yellow dyes. If you experience any of these allergic reactions, ask your doctor to check for nasal polyps. Nasal polyps increase the chances of developing long term, chronic sinusitis. Big ones may even alter the shape of your nose permanently. The color of mucus may be green, yellow, and brownish or it may be clear. If you are suffering from fever and there are signs that your general health is being affected, such as difficulty breathing, shortness of breath, loss of appetite and generalized fatigue and body aches, visit your doctor right away. Mostly excessive secretion of thin, clear mucus indicates simply allergies or flu. But sometimes it could be the symptom of a drug reaction or allergic reaction to a certain food item. It can also point towards a deviated septum or indicate an irregularity in the nasal passage. If the consistency of mucus is very thick, it may indicate that your body is very dry. Dry air and heating systems can cause mucus to thicken and make you uncomfortable by obstructing breathing passages. If your mucus turns green, yellow, or even reddish brown in color it could be a symptom of a bacterial infection. There are many ways to cure excessive mucus buildup in throat. Below both medical and natural remedies are shown. There are basically four groups of pharmaceuticals you may use to get rid of excessive mucus buildup in throat - e.g. decongestants, nasal sprays, antihistamines and expectorants. Decongestants reduce swelling in inflamed tissues and blood vessels and thus relieve congestion (1, 2). Many decongestants can be purchased over the counter without a doctor’s prescription. The most widely used decongestant drugs contain active ingredients including phenylephrine, oxymetazoline or pseudoephedrine. They provide relief from nasal congestion and are helpful for treating build up of mucus in throat. They are helpful in providing relief from conditions such as flu and common cold, sinusitis, allergic rhinitis and other allergic reactions. Decongestants act by alleviating the swelling of the blood vessels in the nasal cavity, which helps clear obstructed passages (1, 3). Some medications may just contain a decongestant drug but mostly are sold as combination remedies that contain decongestants, analgesics, and anti allergy drugs. Most people can use decongestants safely but in some cases, their use is not recommended. 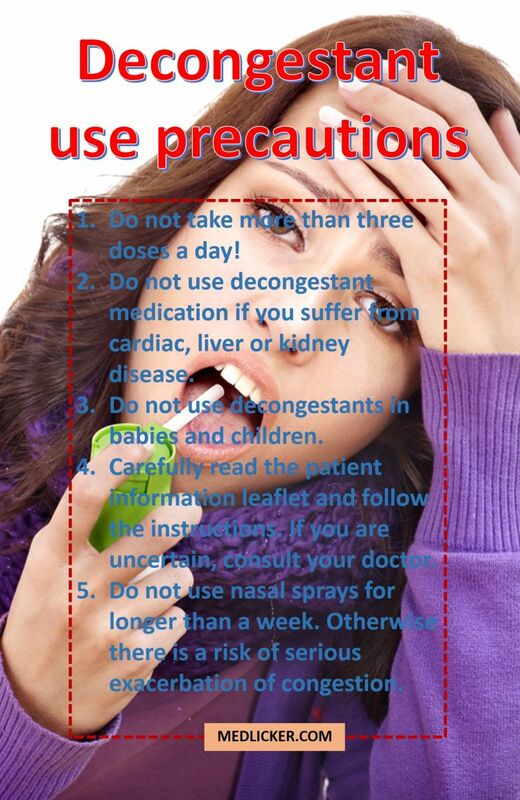 Infants and children – decongestants are not safe for use by children who are under six years of age. Children aged 6-12 should only be given decongestants upon the recommendation of a doctor. Pregnant women and nursing mothers – safety of using this medication during pregnancy and nursing have not yet been established to do not use any decongestants prior to consultation with your doctor. Do not take more than three doses of decongestants in one day. Carefully read the patient information leaflet or check the label of medicine to see dosage instructions and any precautions. If you are still uncertain, consult your doctor. Decongestant nasal sprays should not be used for longer than a week because overusing them can exacerbate nasal congestion. Consult your doctor if your symptoms show no signs of improvement. Decongestant medicines do not usually exhibit any adverse effects, and any side effects that are observed are mostly mild (4, 5). These side effects disappear once you stop taking the decongestants. Sometimes, more serious adverse effects such as hallucinations and severe allergic reaction or anaphylaxis may occur but these are very rare. Nasal sprays can provide fast relief from nasal stuffiness, congestion and build up of mucus in throat. You can purchase decongestant nasal sprays over the counter or upon recommendation from your doctor. They relieve stuffiness and dislodge mucus by deflating swelling of blood vessels in the lining of your nasal cavity and respiratory pathways. Don't use decongestant nasal sprays for more than three days, or your cold symptoms could aggravate. They are also known as saline nasal sprays and can be purchased without a prescription. They dislodge and loosen up your mucus and prevent it from thickening. Since they don't contain any drugs, feel free to use them without any worries of dosage or side effects. They are available both as over the counter products and as prescription medicines. They are generally used to relieve allergy symptoms but are also sometimes used to relieve stuffiness experienced during a sinus infection and to clear congestion. First of all, blow your nose on a tissue or over a sink to clear up nasal passages as best as you can. Then remove the cap off the spray bottle and follow the directions for "priming" or shaking the pump, if required. Close one nostril by placing a finger against it gently. Place your thumb at the bottom of the pump of the spray. The hole at the top of the spray bottle should be below your open nostril. Push the pump and inhale in lightly. Now repeat the same process for the other nostril with a thumb placed on the nostril that has been sprayed. After doing thus, do not blow your nose right away. Try not to sneeze. This will help keep the medicine longer in your nose. Some sprays have different directions given on their label so follow accordingly or consult your doctor. Don't use nasal sprays longer than instructed by your doctor. Antihistamines are useful in the treatment of allergic reactions and for reducing excessive mucus production (6, 7). Antihistamines exert their effect by blocking the release of a substance called histamine in the body. Histamine is released as a result of exposure to an allergen. Histamine triggers irritation in the sinus cavities, chest, throat, nose, and skin and can lead to allergy-induced asthma attacks. Antihistamines dry up excess mucus from the body and should not be used concurrently with expectorant drugs. You should be cautious while using antihistamines as they can cause severe drowsiness. Expectorants are commonly used to reduce excessive production of mucus (8, 9, 10). These drugs act by thinning mucus in the chest and lubricating surfaces so that mucus is expelled through coughing. The most popular expectorant drug is guaifenesin. Guaifenesin does not cause any considerable side effects in healthy adults. This drug should be taken with a glass of water, or else there is a risk of dehydration. Expectorants are widely used in the treatment of respiratory disorders and bronchitis. During expectorant use, the mucus becomes thinner and the user may cough more frequently. This cough irritates the throat. That is why expectorants are generally sold together with a cough suppressant. There are also lots of natural and home remedies, which may help you get rid of excessive mucus in throat. Here are some of the most popular ones, including instructions on how to use them. Remember that home remedies should only be used in association (and not as a substitute) with proper medical treatment. Always ask your doctor for his/her consent before using any home remedies for any disorder. Honey is an excellent home remedy for soothing a sore throat, clearing up mucus and providing relief from cold symptoms. The easiest home remedy for treating a buildup of mucus in the throat is to mix a spoonful of honey and lemon juice in a glass of lukewarm water. If you drink this lemon honey water three to four times a day you can easily achieve relief from mucus in throat. Orange juice contains lots of vitamin C and is a great decongestant as well. Make sure that you take 500mg of vitamin C three times a day via food or supplements. A glass of a pure 100% orange juice contains about 124 mg of vitamin C. Other rich sources of vitamin C are strawberries, lemons, and tomatoes. Do not drink too much orange juice as it may be harmful. Hot tea not only soothes your throat but also helps to dislodge mucus. Black tea alleviates discomfort and chases away cold with a good dose of virus-fighting interferon. Make some black tea and mix in some honey for soothing your throat and add a squeeze of lemon for vitamin C.
Gargling daily with lukewarm salt water is a brilliant home remedy for a sore throat and excessive mucus production. Gargling with warm salt water helps abort the bacteria present in your system. Simply add half a teaspoon of refined salt in a glass of warm water. Stir and mix it properly and then gargle with this solution over a sink three times a day. Pepper can be used in various ways to treat the various symptoms of the common cold at home without much hassle. If you have an accumulation of mucus in throat, add pepper in your daily meals. Gargling with hot water and pepper solution is also effective. If you cannot eat or drink pepper you can get benefit from its medicinal properties by smelling it regularly. The capsaicin content in pepper makes mucus thin, and thus provides relief from nasal stuffiness and congestion. Homemade red onion syrup is a great remedy for treating symptoms of cold and flu such as accumulation of mucus in throat. To prepare the syrup you will require two or three red onions and honey or brown sugar. Take three red onions and cut them into horizontal slices. Now place one slice of raw red onion in the bowl and glaze it with honey. Repeat this process until the bowl is full. Cover it with a lid and leave it for twelve hours. When you will open the bowl, there will be thick red onion syrup. Use a spoonful of this syrup two times a day to obtain relief from mucus in throat. Garlic has antiseptic and bactericidal properties which make it a valuable ingredient for treating symptoms of cold such as mucus in throat. 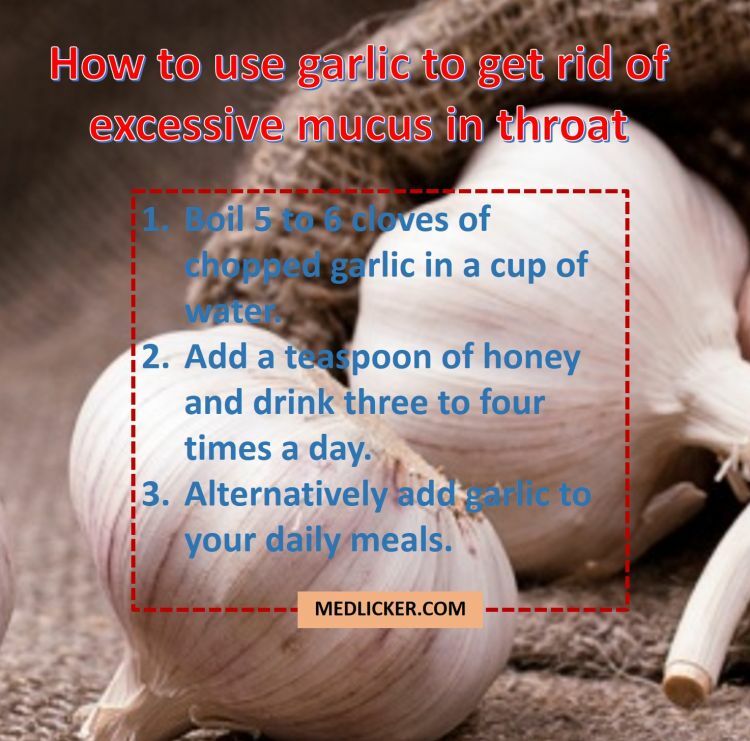 How to use garlic to get rid of mucus in throat? Garlic gives the immune system much needed boost during illness and helps in clearing up the respiratory passages and also helps in eliminating the toxins inside your body. The easiest way to use garlic during a sinus infection or cold is to boil five to six pieces of chopped up garlic in a cup of water. Add a teaspoon of honey and drink this three to four times a day. You can also eat raw garlic, add garlic in your daily meals or use garlic oil to benefit from its medicinal properties. Ginger is also a popular ingredient for treating sore throat and respiratory disorders. It is easily available to everyone. Include it in your daily meals or eat it raw to treat mucus in throat and flu. Another way to use ginger is to brew ginger tea or make a ginger juice. Add honey to maximize health benefits of ginger tea. You can store and refrigerate ginger juice and use it whenever you want to. Homemade chicken soup is full of essential nutrients and antioxidants to help fight infections, flu, and cold. The brilliant antioxidant traits of chicken soup help cure a cold and flu swiftly and loosen mucus in throat. It also gives your body a lot of strength. For optimal results use organic vegetables and chicken for preparing the soup. Mullein tea is a popular home remedy for relieving chest congestion and mucus buildup in throat experienced during cold and flu. It acts as an expectorant and dislodges trapped mucous and comforts a sore throat. Fill a strainer or tea ball with dried mullein herbs and steep in a mug of boiling water for ten minutes. Add sugar or raw honey and drink whenever required. Cayenne pepper helps the body expel mucus accumulated in the nasal cavity and throat. The stimulating and warm quality of cayenne pepper also helps relieve pain in chest and soothes an irritated throat. Drink this mixture every day to reduce over production of phlegm and mucus. You can also include cayenne pepper in cooking your daily meals. Do not use decongestant medications if you are a cardiac patient or suffer from liver or kidney disease. If you are a pregnant or nursing mother, do not take decongestants without consulting your doctor first. These are not safe for use in babies and children. Nasal decongestant sprays should not be used longer than prescribed by a doctor as they can aggravate irritation in the throat and cause excessive production of phlegm. Anti histamines may cause drowsiness. Do not use them before driving or operating heavy machinery. Use herbal home remedies carefully if you are pregnant. Mucus in the throat is usually a symptom of another condition such as asthma, nasal polyps, sinusitis, rhinitis, etc. Visit a doctor when mucus in throat begins to cause discomfort and/or when you do not feel well (have chills, fever, neurological symptoms, such as diziness or symptoms such as nausea, etc). Avoid meat dishes and fried, excessively sugary and highly processed food items. And remember than "An ounce of prevention is worth a pound of cure" so make sure you do not catch a cold or flu, which are some of the main causes of excessive mucus in throat.